realized quickly that any and all adventures in Burma are best left unplanned. It was a recurring theme during my entire time there in March / April 2012 -- visiting the village of Dala, Yangon's closest island, was completely spur of the moment. bike with a 20-odd chickens attached. Hmm. Friendly touts tried their best (only) line, though it never approached pushy. "You're handsome. Buy something?" After grabbing some food at a street-side stall, I hopped on my very first trishaw to check out the area. Not sure what a trishaw is? Think bicycle plus sidecar. 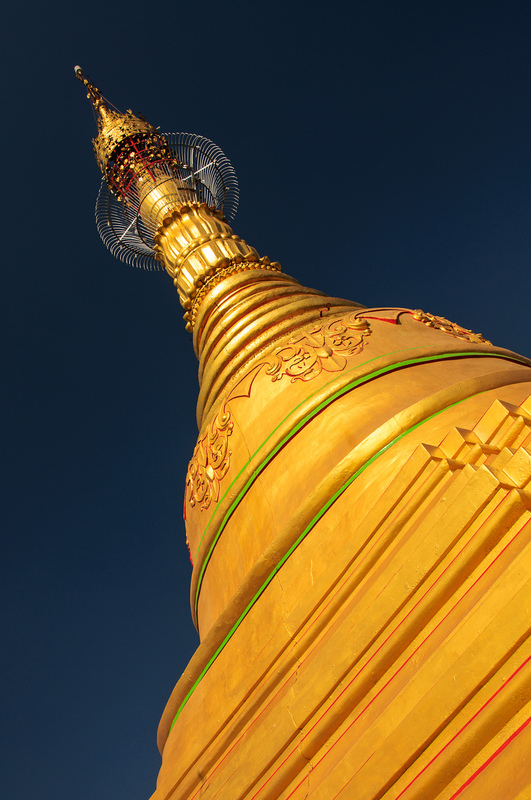 Shwe Sayan Pagoda was the first of many pagodas I would visit in Burma. On the site was actually a mummified monk lying in a glass case that once lived here. As the story goes, a few years ago, he opened his eyes the day before a cyclone hit neighbouring Thailand. As the day wore on, and the intense sun began to soften, the people in the town began to come out to the streets with their pails and jerry-cans to fetch water. Lines formed near the pond and they slowly made their way down the wooden dock. 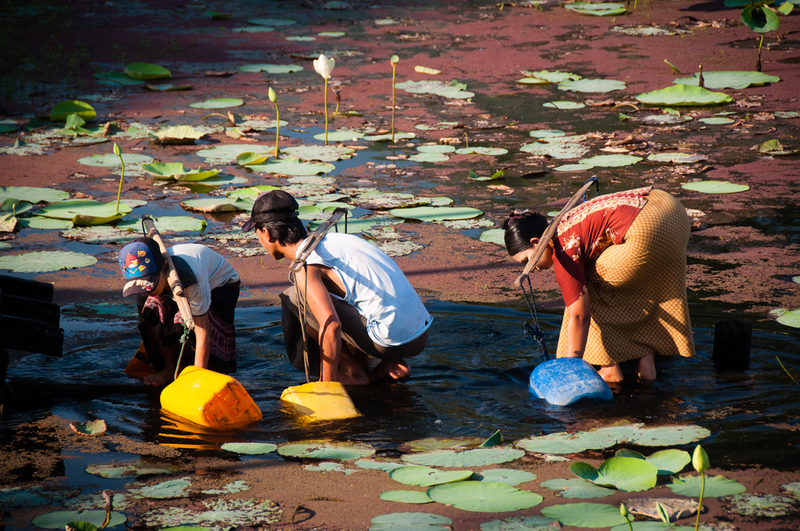 When it was their turn, 3-4 people would step out into the water, turn around, crouch down to fill their pails, stand, and then slowly make their way up the dock to head home. The water was definitely not potable. The streets in Dala, Myanmar are a mix of harsh, dusty dirt roads, and some concrete. The town and area was ravaged by Cyclone Nargis in 2008 that claimed 138000 casualties in the region. Jugo's entire family, with the exception of his grandfather, were among the casualties. Nearly 4 years on, there were still signs of the destruction, with large felled trees still sitting in ditches and ponds. Animals including chickens, goats and even cows would roam around freely. 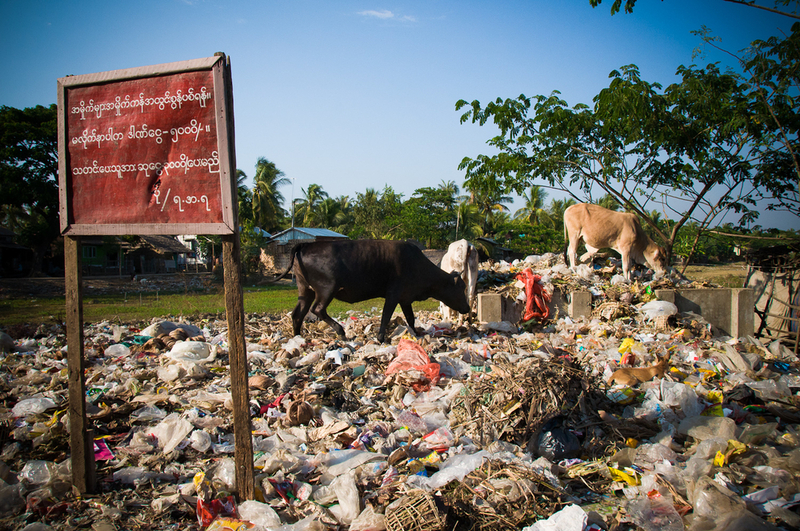 The local garbage pile was a favourite plac of the cattle. The heat made for an exhausting day, and with the sun setting, it was time to head back to Yangon. Once again the feeling aboard the ferry was a mixture of lively salespeople and napping passengers on the floor in the corner. Some would buy noodles from the touts to throw to the hundreds of seagulls circling the boat. One boy even held out a chunk for a brave bird to come and take it from his hand. t was clear from my first full day in Burma that it would be hot, dry and full of awesome. Dala, Yangon, and the rest of Myanmar kept that promise.